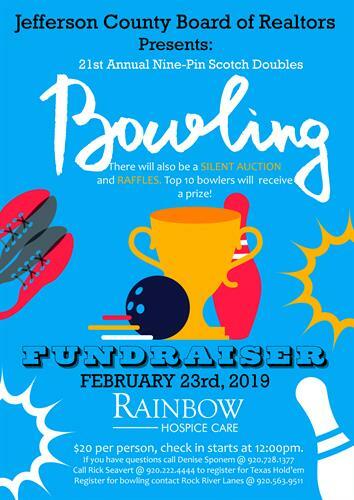 Jefferson County Board of Realtors presents 21st Annual Nin-pin Scotch Doubles Bowling. There will also be a silent auction and raffles. Top 10 bowlers will receive a prize. $20 per person. Check in starts at 12pm. If you have questions, call Denise Sponem @ (920)-728-1377. To register for Texas Holdem contact Rick Seavert @ (920)-222-4444.